21 projects qualified for the DOC LAB POLAND 2019 - a programme for documentary film-makers. Among the participants there are, among others, the director Michał Szcześniak, whose award-winning "Starting Point" was included on the 2015 Academy Awards shortlist, Rafael Lewandowski, known for his feature film entitled "The Mole," Leszek Gnoiński, the creator of the television show "The History of Polish Rock" and Natalia Grzegorzek, the producer of the films "A Coach's Daughter" and "Kamper". The first session starts on the 1st of April in the Centrum Łowicka in Warsaw. Władysław Ślesicki Film Foundation, together with the Krakow Film Festival and Partners organise for the fifth time the DOC LAB POLAND - the largest programme for documentary film-makers in Poland. The effects of previous four sessions are almost 90 projects developed during the workshops, out of which over 35 films are already finished, about 150 further projects from Poland and abroad, which participated in the Co-production Markets and about 700 individual meetings every year - a total of over 2500 meetings of producers and directors with potential co-producers, experts, sales agents and festival selectors. The first workshop session of this year's programme will be held in the Centrum Łowicka in Warsaw, from the 1st of April to the 11th of April. During this time, meetings with experts and workshops for authors of the projects are organised: the DOC LAB START for projects at the development stage or early filming stage, and the DOC LAB GO for the films at the editing stage. 18-year-old Antek, who lives in Warsaw, was named the incarnation of one of the 21 disciples of Buddha in the last will of the great Buddhist teacher,Czime Rigdzina Rinpoche. A young traditionalist tries to live in accordance with his beliefs. Life confronts his theoretical views with practice. The story of two brothers who turn into young men from little boys. How do they shape their masculinity? What makes them become who they become? DO I STILL GET ON YOUR NERVES? The neighbours Monika and Mariusz fought with each other, he organised concerts at home at night, she wanted to sleep. They met at the funeral of the best friend ... of them both, they became a couple and now they quarrel because of jealousy. 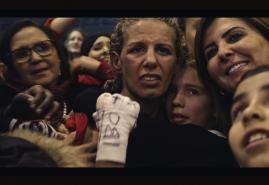 Yara is a ten-year-old who has already won the boxing championship and the Belgian beauty contest for children. She is not used to losing. Failure, however, is a part of the bitter process of entering adulthood. The Olympic Games Melbourne 1956 - Janusz Sidło is the front-runner in the javelin throw competition. At the decisive moment, he decides to lend his javelin to his most dangerous rival. Ever since Lili divides her life into a week with her dad and a week with her mum, she would like to know as much as possible about the world of the adults. What would be her wish before her great journey on her eighth birthday? A man in the body of a boy. This is the story of 26-year-old Tomasz, who suffers from a very unusual disease. His mind develops normally, but his body stopped developing when he was 10 years old. What do a famous presenter, a retired scientist and a housewife have in common? They have a dream - in spite of retirement age, they want to return to the labour market. The problem is that the contemporary world does not need them. Jana (26), an ambitious artist from Belarus, to the general surprise, decides to become the Miss of Poland. This year is her last chance to win. A documentary film portraying the figure of Barbara Hulanicki, the founder of the legendary Biba. A fascinating biography of one of the most important people in the world of fashion. After the death of his parents, 14-year-old Miłosz is looked after by his elder sister. A new family structure is built, based on unconventional principles. Demas Nwoko, a genius Nigerian architect and the 63rd child of the king, together with his grandson Uno prepares a performance based on the play written by Demas in 1977, entitled "Children of Paradise." A bold view on the people with disabilities. Tolerance, social empathy and the ability to communicate with someone "different," to look at them in the "normal" way is an extremely important subject nowadays. A documentary tale with some black humour about an unusual athlete, for whom the toxic relationship with his family is a bigger obstacle to winning an Olympic medal than the lack of arms and legs. A film about Andrzej Dziubek, who escaped from communist Poland when he was seventeen years old. He settled down in Norway, where he started the rock bands DePress and Holy Toy. A Highlander from Orava became a star in Scandinavia. Zbigniew Herbert was not only a poet: he was the symbol of the opposition and the moral guide, a humanist deeply rooted in the European culture. He was also a man who struggled with extreme emotions. A couple of eccentric businesspeople runs the largest pawn shop in Silesia. When the financial situation becomes dramatic, and their love starts to die, they will fight the most difficult fight in their lives. A film about a little girl who lost her home and friends and how she tries to find all this during her adventure which led her as far as to the moon station. The 18-year-old boy, after leaving the orphanage, returns to his father to start fighting for a new, happy life. In need of changing the distanced relationship with her reclusive father, a grown-up daughter invites him to attend the dance course by Linda Hop together with her. Will taking the father out of his comfort zone bring the expected effects? THE DOC LAB POLAND is a programme for documentary film-makers who have already made their first films. It is a consulting programme, in which the experts and the participants are equal partners, who hold discussions and debate together about the best solutions for the films. Among the tutors of theDOC LAB Poland, there are directors Paweł Łoziński, Lidia Duda, Bartek Konopka, and Anna Wydra. The experts from abroad include, among others, the director of the festival DOK Leipzig - Leena Pasanen, the director of the EDN European Documentary Network - Paul Pauwels, the director of the production at the HBO Europe Hanka Kastelicova, the selector of the IDFA Festival Rada Šešić and many others. During the first session, the projects of the participants are discussed in terms of the dramaturgy development, there are workshops about financing the projects, promoting them, preparing a teaser and about festival strategy. In the second part, within the frames of the Industry at the Krakow Film Festival, the participants of the projects prepare to present their projects (to pitch them) to the international group of experts. The documentary film-makers also have the opportunity to take part in individual meetings with the representatives of the film industry from Poland and abroad. The participants of the component START meet with potential co-producers and institutions financing production, whereas the participants of the component GO! meet with the festival selectors and distribution partners. The most interesting projects and the best presentations win awards. In the 2018 edition, the financial and in-kind prizes amounted to over 80 000 PLN. During the Krakow Film Festival, further 40 producers from Poland and from abroad participate in the Co-production Market DOC LAB POLAND. In 2017, the Warsaw Film Festival joined the group of the partners of the DOC LAB POLAND - during the festival, the third consulting session is held, and the projects by the participants are presented to the experts visiting the festival. The DOC LAB POLAND is also a series of screenings of the most interesting recent Polish films (HOT SELECTION) and open lectures on documentary films. Many projects developed within the frames of the DOC LAB POLAND are already finished and win awards at the international festivals. The award-winning films include, among others, "The Prince and the Dybbuk," dir. Elwira Niewiera, Piotr Rosołowski – the festivals in Venice, Minsk, Krakow and the Docs Against Gravity in Warsaw, "Unconditional Love," dir. Rafał Łysak – the Golden Hobby-Horse at the Krakow Film Festival in 2018, "The Ugliest Car in the World," dir. Grzegorz Szczepaniak, the Golden Hobby-Horse and the Student Jury Award at the Krakow Film Festival in 2017, and the audience award at the International Film Festival WATCH DOCS Human Rights in Film, "Call Me Tony," dir. Klaudiusz Chrostowski - the award at the Festival in Amsterdam and at the Docs Against Gravity in Warsaw. At this year's Warsaw Film Festival, the audience award went to "Concerto for Two," dir. Tomasz Drozdowicz. The creators of the DOC LAB POLAND are Adam Ślesicki together with Katarzyna Ślesicka. The coordinator of the project is Monika Zarzycka. The organiser of the DOC LAB POLAND is Władysław Ślesicki Film Foundation, and the strategic partner and the co-organiser of the session in Krakow - the Krakow Film Festival. The programme is supported by the DOK Leipzig, the most important documentary film festival in Germany, the EDN – the European Documentary Network, the Czech IDF – the Institute of Documentary Film and the Warsaw Film Festival, the Foundation for Polish-German Cooperation, the Ministry of Culture and National Heritage, the Polish Film Institute, the National Film Archive - the National Audiovisual Institute, Adam Mickiewicz Institute, the Masovia Institute of Culture, the Krakow Festival Office, the HBO Europe, the Creative Europe Desk Poland, the Centrum Łowicka, the Krakow Film Commission, the Krakow Film Cluster, the Masovia Warsaw Film Commission, Michalak Kosicka Zawolski & Partners Legal Counsel Law Firm, the Polish Audiovisual Producers Chamber of Commerce, the City of Warsaw. The media partners are: the Polish Docs, the Film Pro, Film &TV Kamera, TVP Kultura, Vogue.pl. the photo comes from the project "I Want It All"